184 pages | 12 B/W Illus. The early years sector is going through a period of unprecedented change. 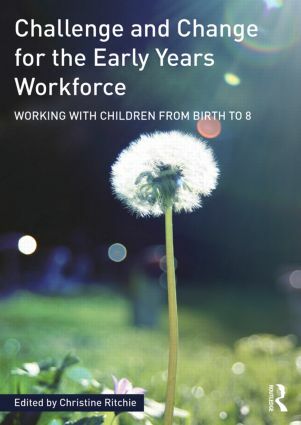 This has resulted in significant challenges for the early years workforce and it is crucial that settings, teams, leaders and individual practitioners respond to these if they wish to continue to provide the best care and education for young children. This timely text identifies and addresses the key challenges for those working with young children from managing personal and professional change, adapting to new legislation and considering new ways of thinking about children’s early learning. It considers the core knowledge and understanding of good practice that enables practitioners to respond appropriately and with confidence to issues they face on daily basis. Aimed specifically at those that are studying and working with children from birth to 8, this book will be a core text for Foundation Degrees in early years, early childhood studies and those working towards Early Years Teacher Status. Christine Ritchie has been working with children and adults in education for over 40 years, including in her role as Senior Lecturer in Childhood Studies at Canterbury Christ Church University, UK.